Benthik is the world of traditional epic game of Yogyakarta that utilizes two pieces of wood and usually wears straight stems of different lengths. The Benthik game is taken from the term sound (item / tools) or sound of two sticks touching each other, so this game is called the Benthik game. Usually benthik games are played by children in vacant times to avoid things that aren't useful. Benthik games have two groups / teams. This game consists of "throwing player (inner team)" and "field guard players (outside team / benthik guards)". This game is done by throwing short wood and then the "guard player" does everything, so that the "throwing player (inner team)" can stops from the benthik game. Train cooperation as part of a team. Train intelligence - This game consists of numbers and summation scores. Helps increase endurance and physical development. Train talent and mental development. Train the strategy to win. Problem solving in front of him. There is no Referee Guard, so this game can train honesty. Creating a friendly atmosphere and environment. Improve friendships and solidarity systems. Practice the power of thinking and discussion. Usually benthik rods have the same diameter size with different lengths. Benthik field guards should not be too close to the throwing team (inner team), because they can get hurt. Although there is no special security in this game; "throwing player (inner team)" always avoid from the team of the field guard players. So that the wound in this game will not happen to the field guard players. Read more about: Benthik Games (inactive). This game is like a Baseball game. Prepare wood (twigs) with the length of each stem. The benthik stem length is about 30 cm and the shortest is about 8 - 10 cm. Make a hole in the ground with a length of approximately 6 - 10 cm, width of ± 3 - 4 cm, depth of hole ± 4 - 5 cm. (Image: A and B). 2 people; 1 Benthik throwing player (inner team) = 1 field guard players. 4 people; 2 Benthik throwing player (inner team) = 2 field guard players. 6 people; 3 Benthik throwing player (inner team) = 3 field guard players. The area: 1 and 2 is the value of zero for "throwing player", try benthik throws not in this area. The "kick-back system" also doesn't apply to determining zero values (players inactive) in this area (The area: 1 and 2). 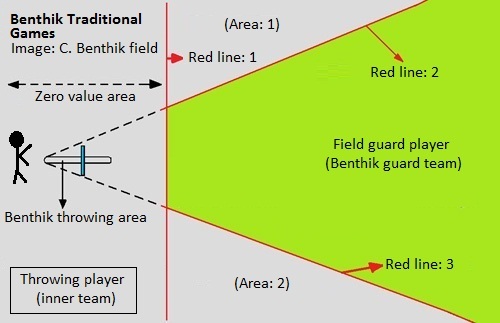 But field guard players can use this area to do a "kick-back system" to the border area (The Red Line) or "zero value area". Read more about: Benthik Games (inactive). Usually the benthik field isn't wide or depends on the number of players. And this game is more popular, but the determination of the standard size is uncertain. How to play Benthik Game? Benthik players throw items (short wood) by gouging / levering with long wood and being thrown into the terrain that is guarded by the opponent (field guard players). After throwing, long wood must be placed on the ground. (Image: C). Then the long wood will be shot by the "field guard players". After the benthik falls into the opponent's field, the guard player must throw back to the wooden target placed by "throwing player (inner team)". If the "field guard players" cannot shoot long wood (touching the length of the wood), then the "throwing player" is said to have passed / succeeded in continuing the next game. If at the time of successive benthik throwing it is not captured by the opponent 2 times. Benthik players can count points with wood (long wood). Calculating the value starts from the point of the throwing hole or it can also be from "red line one" until the benthik (short wood) stops. If in this case there are no problems then proceed with "Double beating System". How do I do the "Double beating" on the benthik games? Short timber placed on the end of the hole (Image: B). Then it is hit at the end of the benthik, the wood will soar upwards and "short wood" is hit again. The farther the small wood is thrown into the guard field, the more points will be obtained from "Double beating" on benthik games. Read more about: "Assessment in the game benthik" and "Bonus points." "Double beating" is an event to make a double punch when benthik wood (short wood) soar upwards or the chance for a "throwing player" to hit a benthik before the benthik falls to the ground. If benthik wood falls on the ground, then the "throwing player" cannot continue the next benthik game. Benthik that was thrown isn't caught by the opponent or "field guard players". Benthik was thrown into the area of value or the green field. Short wood isn't in the benthik or "red line" boundary. Short wood doesn't touch the red line. When "kick-back system"; the item doesn't return to the "zero value area". When throwing a target (field guard player) doesn't touch the "long wood". At the time of throwing (short wood) can be caught by the guards Benthik. Short wood stops at the benthik boundary area. Short wood is thrown back by field guards to the border area (Red Line) or "zero value area" with a foot kick. We call the event the "kick-back system". This can be done if the wood thrown (short wood) is still rolling / moving and must be carried out by the field guard / guard respectively. When the wood is still rolling / moving and doing a "kick-back system" by the opponent and just approaching the "zero value area", then the shot must be done at the short wooden stop point. And the shot is carried out on the long stem placed by the thrower and right on target. If that cannot be done (Failure) by a field guard player, then the "throwing player" can complete the next session. Guard player can do a "kick-back system" in a row when short wood still continues to roll towards the red line or "zero value area". This can be done by all "field guard players. But if the item stops then the player throws it to the target point (long wood). Summary of benthik (inactive) games. Short wood is at the benthik boundary or "Red Line". Short wood touches the red line. Short wood is captured by field guard players. When short wood is rolling, the item returns to "zero value area". The Benthik player reached 2 consecutive times and then "Double beating". Class calculates distance with long wood. If successful at this section, please continue "Double beating". Value of distance calculation with short wood. The Benthik player reached 2 consecutive times and then "Double beating". Class calculates distance with long wood. And continue playing one more time or repeating the benthik game and then "Double beating". Value of distance calculation with short wood. "Double beating" is only done once for calculating the value with short wood and back to the start game (Repeat game), until the player (inactive). Review again about: Reach point of value (volume 1 and 2). If this player is defeated by a field guard player, the player must be replaced by the next player (in the group). After all the players in the benthik throwing group are defeated (inactive), then it is the turn of the "field guard players" to play benthik. The measurement value with long wood. The measurement value with short wood. 1 benthik size (long wood). 1 = 50 points. 1 benthik size (short wood). 1 = 50 points. Benthik games allow each player to get points / scores from "Double beating - long wood and short wood". The summation of scores is usually those combined into one number of scores and is part of the score of a team. 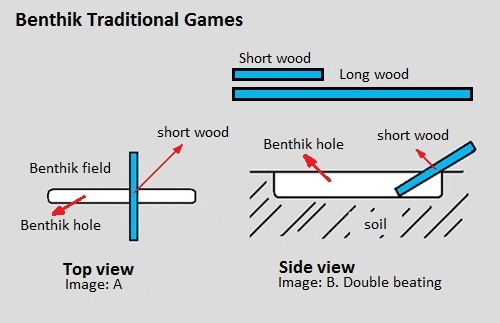 Bonus points in benthik games is a games related to "Double beating - short wood". The difference in making bonus game scores is calculated with "short wood", so the value of the game bonus on the valuation is very influential on the number of points. This is a glimpse and knowledge of the World of Benthik Traditional Games. Field size, number of players, the standard value used is still uncertain, so players must discuss about the Benthik game. Discover the best variety of games in "Epic Travelers - Play Games Traditional Yogyakarta, opens in new window.